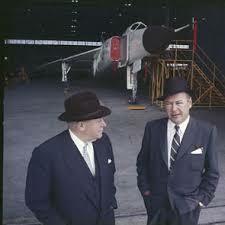 In September 1953, USAF Lt General Donald Putt, head of Air Research and Development Command, visited Toronto with a delegation of twenty-five ARDC officials, includng MIT's Dr A G Hill, head of the Air Force Lincoln Laboratory and a former member of the Beacon Hill covert reconnaissance study group. 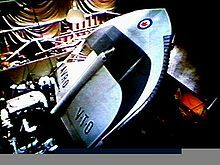 In the course of the trip, he inspected a mockup of Avro Canada's radical supersonic VTOL fighter concept, Project Y. Avro claimed tremendous performance for the shovel-shaped vehicle -- Mach 2.5+ speeds at altitudes of at least 80,000 feet, with extreme rates of climb and excellent maneuverability. 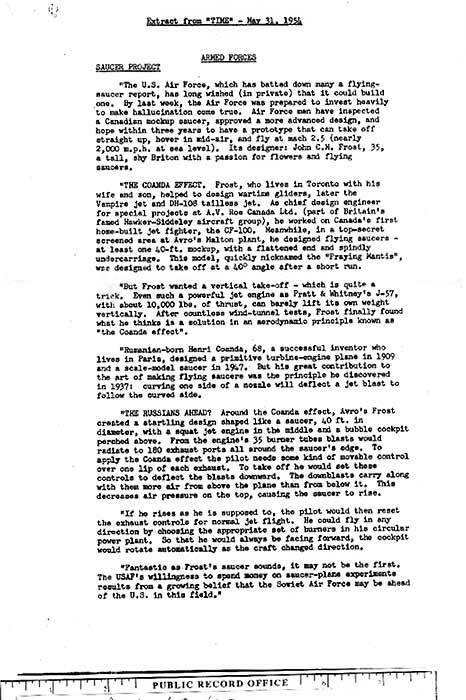 Putt was intrigued, and ARDC immediately began pressuring Avro to submit proposals for US-funded work on the design and its successors. 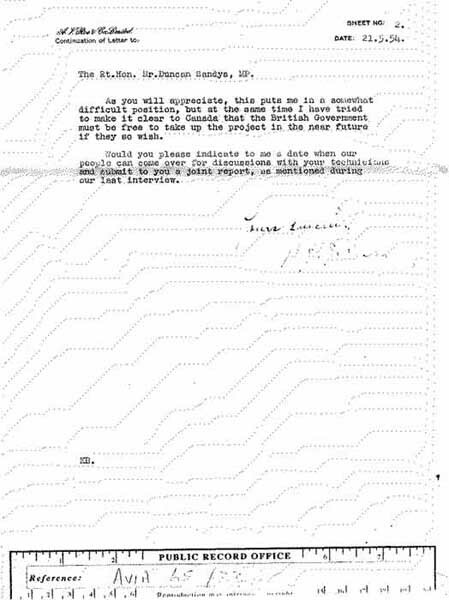 In May 1954, Avro's British chairman, Sir Roy Dobson, wrote to the British Minister of Supply, Duncan Sandys, about the uncomfortable position in which ARDC's great interest in the program placed him, since US funding of the machine might infringe on Canadian or British interest in the project. What was the source of Putt's urgency in this unusual matter? Ten days later, Time magazine published an amazing article on Project Y that revealed significant details about the aircraft's performance and related its operating principles to the aerodynamic theories of French engineer Henri Coanda. 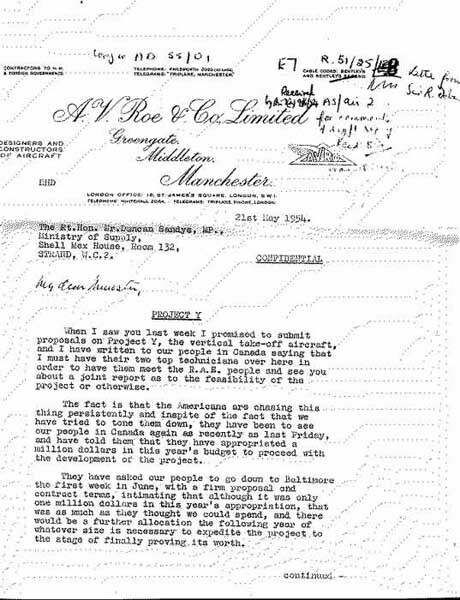 The same day, Harold Bailey, a British government representative in Ottawa, wrote to Denis Haviland at the Ministry of Supply in London, noting Avro's irritation at the leaks coming from Washington. 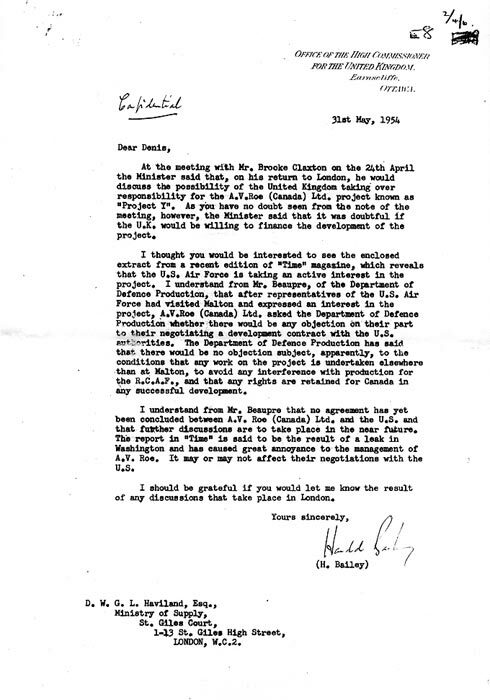 The implication is that, for whatever reason, ARDC was very interested in putting out the message that the Air Force was worried about Soviet saucers and wanted to develop its own.